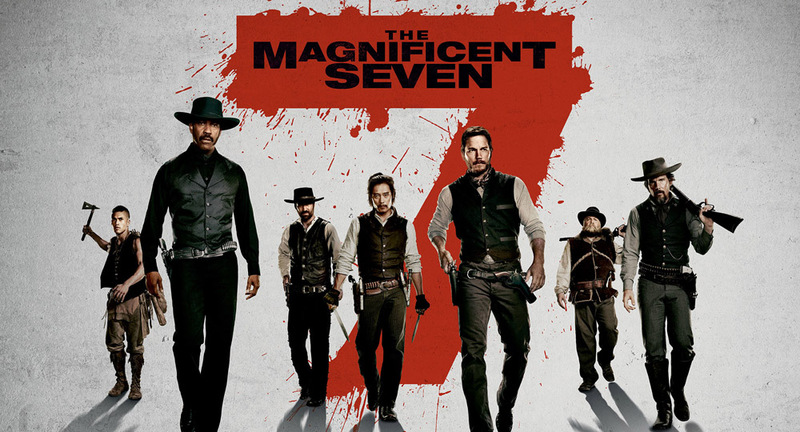 Tony Jones joins the magnificent ranks of Pop Theology with a brief reflection on this week’s #1 box office hit, The Magnificent Seven. Ryan told me that Chris Pratt steals the show in Magnificent Seven. But I respectfully disagree. It’s Ethan Hawke who made the movie for me. Firstly, he has the best cowboy name, going away: Goodnight Robicheaux. Second, he’s the only actor with period-appropriate crooked, gold-capped teeth. And third, he’s got the best backstory: Goodnight was a sharp-shooter in the Confederate army who killed a couple dozen men at Antietam. Grievously wounded, he was rescued by Chisholm (Denzel Washington), then a Union soldier. That’s led Goodnight to have qualms about killing. In fact, he can’t pull the trigger in the first battle of the Seven — so now we can see why he has a hired gun (and knife) in Billy Rocks (Byung-hun Lee), who does Goodnight’s killing for him. In fact, Hawke as Goodnight brings us the best respite from Antoine Fuqua’s almost comic-level of violence in this remake. Until the last battle, the Seven are untouchable, but they seem to kill a bad guy with every shot. I can’t remember them missing even one. Goodnight, however, is wounded — his wound is a psychic one. While this Seven doesn’t live up to its predecessors, Ethan Hawke again reminds us what an extraordinary actor he is, and Goodnight’s inner struggle is a redeeming aspect of an otherwise so-so movie.